We had a special guest over for dinner not too long ago, and we wanted to have something to snack on that was spanish-y but a little different than a slice of bread with a tortilla. I decided it was the perfect opportunity to buy the quail eggs I've been eyeing since I got here. 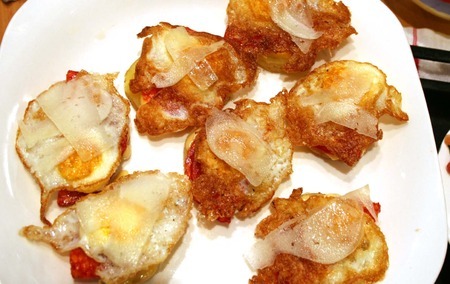 I fried them up, used boiled potato coins as the base (in place of bread, which Chip and I both agree we are a wee bit tired of), added a slice of the tastiest chorizo Spain has to offer, plus a little mayonnaise/ailioli to lend creaminess to the pintxo. The result was a surprisingly delicious snack with a perfect combination of familiar flavors and a playful presentation. A party hit. Best warm, but also delicious after sitting out for hours. Bring a pot of salted water to boil (throw in a bay leaf and some olive oil, optional). Slice potatoes into thin "coins" and boil until just tender. 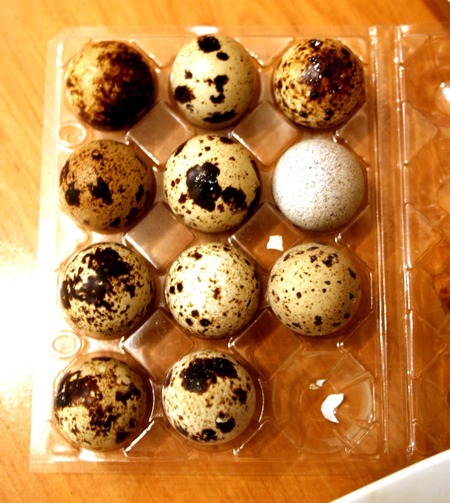 Heat oil over med high heat and fry quail eggs; drain on a paper towel and sprinkle with salt. Spread cooled potatoes with mayonnaise. Add a slice of chorizo, an egg, and a couple shavings of cheese.